CrossFit Endurance Classes Coming Soon! Are you a runner, cyclist, triathlete and/or endurance athlete? CrossFit Endurance is coming to SandyDog CrossFit. 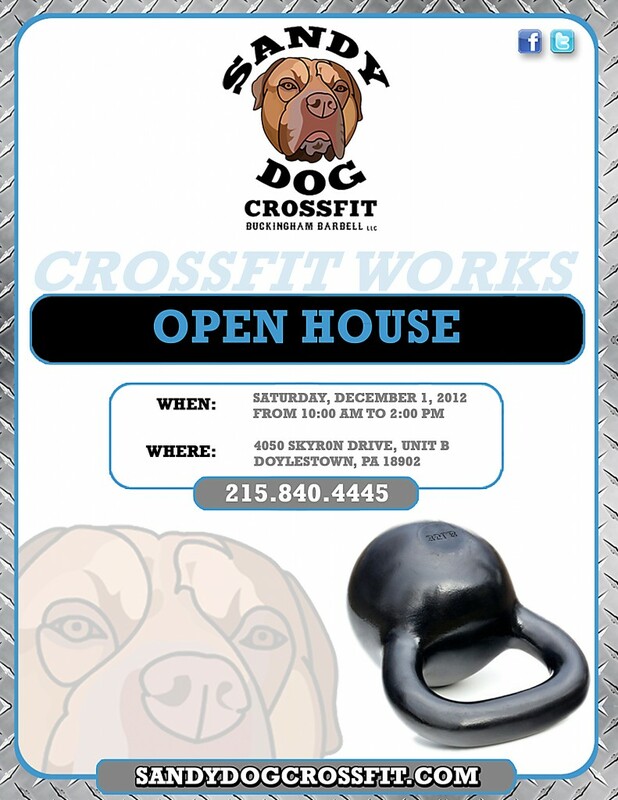 Please email info@sandydogcrossfit.com or call 215-840-4445 for more details. Sign up as a spectator and come support our own Lindsay Peters and Craig Marone! Friends, Coaches, and CrossFit Affiliate Owners,CrossFit Novem and Trap Door Athletics are pleased to invite you, your athletes, and your greater CrossFit community to be a part of the First Annual Philadelphia Winter Warmer! This 200-athlete, regional competition will be held on Saturday, January 12, 2013 at the Piazza at Schmidt’s in Philadelphia, PA. The Piazza is an outdoor venue in one of the hottest neighborhoods in Philadelphia that will be tented for our event, transforming it into a 20,000 square foot, versatile (and heated!) CrossFit arena.A portion of each ticket sold supports the work of our charity partner. The Philadelphia Winter Warmer is proud to give back to a community that has given us so much.We are anticipating a sold out event, with space for 200 individual athletes (100 men and 100 women) and 300 spectators. Current event plans include a DJ, food trucks, vendors from across the Mid-Atlantic and Northeast regions, beer included in the price of admission/registration, spectator competitions, the 2013 Cheesesteak Bowl (a cheesesteak eating competition – we are in Philly, after all), and so much more – both for athletes and spectators.Please expect an e-flyer (for print and for posting on your blog and Facebook page), and keep your eyes on your mailbox for an 11 x 17, full-color poster for you to hang in your box.Registration opens on Monday November 5th, 2012! We appreciate your help in spreading the word about what promises to be an awesome event! Questions? Email us at info@philadelphiawinterwarmer.com. Check out our website for more information and updates – www.philadelphiawinterwarmer.com.Save the date – we’ll see you on January 12, 2013!In health! Do you know a yoga instructor who understands crossfit? If so please have them contact me about yoga at SandyDog. CrossFit Novem and Trap Door Athletics are pleased to invite you, your athletes, and your greater CrossFit community to be a part of the First Annual Philadelphia Winter Warmer! This 200-athlete, regional competition will be held on Saturday, January 12, 2013 at the Piazza at Schmidt’s in Philadelphia, PA. The Piazza is an outdoor venue in one of the hottest neighborhoods in Philadelphia that will be tented for our event, transforming it into a 20,000 square foot, versatile (and heated!) CrossFit arena. A portion of each ticket sold supports the work of our charity partner. The Philadelphia Winter Warmer is proud to give back to a community that has given us so much. We are anticipating a sold out event, with space for 200 individual athletes (100 men and 100 women) and 300 spectators. Current event plans include a DJ, food trucks, vendors from across the Mid-Atlantic and Northeast regions, beer included in the price of admission/registration, spectator competitions, the 2013 Cheesesteak Bowl (a cheesesteak eating competition – we are in Philly, after all), and so much more – both for athletes and spectators. Please expect an e-flyer (for print and for posting on your blog and Facebook page), and keep your eyes on your mailbox for an 11 x 17, full-color poster for you to hang in your box. Registration opens on Monday November 5th, 2012! We appreciate your help in spreading the word about what promises to be an awesome event! Questions? Email us at info@philadelphiawinterwarmer.com. Check out our website for more information and updates – www.philadelphiawinterwarmer.com. Save the date – we’ll see you on January 12, 2013! Facebook Matt Daly who is collecting gas cans to take gas to Hurricane Sandy victims in need.